Tulln, Lower Austria: To Egon Schiele (1890-1918), who is, along with Gustav Klimt and Oscar Kokoschka, considered to be one of the most important Austrian painters of the last two hundred years, a new museum has been dedicated, located in the house where he was born and where he spent first eleven years of life. 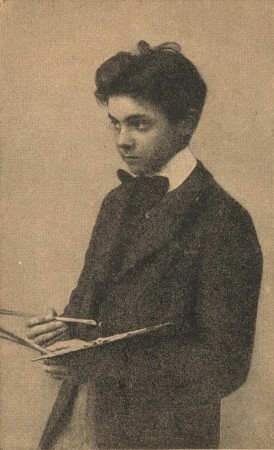 Egon Schiele saw daylight in 1890, as the third child of a high ranking clerk of the Imperial Railways Adolf Eugen and Marie Schiele, in the town of Tulln on the Danube River. The house in which family spent 15 years was a service residence close to the rail tracks. The family fortunes ended abruptly, following a scandal that Imperial Railways – a powerful and respectable institution in Austro-Hungarian Empire – used as a pretext to degrade and dismiss elder Schiele and under pressure, the family had to move to Klosterneuburg. Back in Tulln, everything interesting and important was somehow connected with the railway. Egon Schiele developed his artistic talent drawing relentlessly the station, travellers and trains. His interest for “industrial wonder” would never diminish, although only few of his railway-motivated works survived. In the new Museum some of them may be seen for the first time! The Museum is not dedicated to the art of Egon Schiele, which is understandable considering the fact that such an institution – also based in Tulln – already exists. Also, the Vienna Leopold Museum, which was founded and for many years managed by an obsessive collector of Schiele’s works, disposes with the world largest collection of his works. Therefore, the concept of the new Tulln Museum concerns itself with details of artist’s private life, including events that conducted to turbulent family development, some hidden family details and contemporary mores and traditions. Premises, only about 120 sqm large, were meticulously restored; owing to the design principles that insists on distances from total reconstruction of the authentic look, the old and the new intermingle, and this becomes particularly apparent in the case of ceiling lighting. Nevertheless, the charm of the contemporary middle class living space has been partially preserved, and visitors have audio-guides at their disposal. The Museum was formally opened on June 15.